Configured for the aspiring filmmaker, the Panasonic Lumix DC-GH5 Mirrorless Micro Four Thirds Digital Camera with 12-60mm Lens and Ninja V Kit from B&H bundles the multimedia mirrorless body and fast Leica DG Vario-Elmarit 12-60mm f/2.8-4 ASPH. POWER O.I.S. zoom lens with an Atomos Ninja V 5" 4K HDMI Recording Monitor, a power kit for the external monitor, a mount for attaching the monitor to the camera, and an HDMI cable. Upgraded and redesigned, the Lumix DC-GH5 Mirrorless Micro Four Thirds Digital Camera with 12-60mm Lens from Panasonic provides an imaging platform for shooters who demand some of the best video and still photography quality they can get in a single compact camera. At the heart of the camera is a 20.3MP Digital Live MOS sensor and a newly developed Venus Engine processor, which both offer dramatically improved processing times over its predecessor. This enables the ability to record 4K video at up to 60 fps, 10-bit 4:2:2 internal recording with select settings, Full HD video at up to 180 fps, 12 fps continuous shooting, and sensitivities up to ISO 25600. Also, the camera features built-in 5-axis sensor stabilization, which can work with certain lenses to activate Dual I.S. 2 for highly effective shake correction that can compensate for up to 5 stops of shutter speed. Other improvements include a speedier and more accurate Advanced DFD autofocus system that can lock on in just 0.05 seconds, as well as 6K PHOTO at 30 fps and 4K PHOTO at up to 60 fps. Along with all these internal improvements, the body received some significant upgrades as well. For viewing and composing images both the 0.76x OLED viewfinder and 3.2" free-angle touchscreen received resolution bumps to 3.68m dots and 1.62m dots, respectively. This will make shooting more comfortable and more accurate. The magnesium-alloy body is now freezeproof to 14°F in addition to splash and dustproof. For fast image transfer and saving, there are now two UHS-II SD card slots. Additionally, for a completely wireless setup it offers both Wi-Fi and Bluetooth for advanced functionality when paired with a mobile app. Bundled with the camera body is the Leica DG Vario-Elmart 12-60mm f/2.8-4 ASPH. POWER O.I.S. Lens, a versatile wide-angle to short telephoto zoom with an equivalent focal length of 24-120mm. The lens is an excellent match for the GH5 with sharp, well-corrected optics that create clear images with minimal aberrations. The lens also has a linear motor for fast, near-silent focusing during stills and video as well as the POWER Optical Image Stabilizer to minimize the appearance of camera shake. Additionally, the durable metal construction of the lens is splash, dust, and freezeproof. The GH5 is a capable video camera in addition to its stills capabilities. The flagship feature is UHD 4K video at up to 60 fps, though another excellent spec is the ability to record 4:2:2 10-bit files at resolutions up to DCI and UHD 4K at 24/30 fps. A full-size HDMI port is present on the camera for high-quality output at 4:2:2 10-bit in all settings for use with external monitors and recorders. The camera also offers high bit-rate recording for highly detailed images free of compression artifacts. For more advanced users, multiple picture styles are available to provide a more gradable image, such as CINELIKE V and CINELIKE D, as well as an in-camera LUT to make monitoring easier. Also, users will have access to overcranking and undercranking settings, which provide speeds up to 2.5x slower in 4K (60 fps) and 7.5x slower in Full HD (180 fps). Also, a 4K Anamorphic mode is available, which will let you record in a proper 4:3 ratio for adjustment in post-production. Dual UHS-II SD card slots are present which provides settings such as Relay Recording to automatically switch cards when one is full; Backup Recording, which records the same data to both cards simultaneously; and Allocation Recording, which lets you save certain files to each card for easier organization. For accelerated autofocus performance, an Advanced DFD (Depth-From-Defocus) technology is employed to quickly calculate the distance to subjects and adjust the focusing position in as little as 0.05 seconds, which enables continuous shooting up to 9 fps with continuous AF. This contrast-detection type focus method benefits both still and video recording modes, as well as subject tracking applications where subject color, size, and motion vectors are used to intelligently lock-onto the moving subjects and ensure precise focus. The sensitivity and speed can be adjusted to further improve performance with certain subjects. It also features 225 AF areas, which provide excellent control over where the camera will focus. Additionally, supporting working in low-light conditions, a Starlight AF feature enables accurate AF performance down to -4 EV. A mechanical focal plane shutter enables a fast maximum shutter speed of 1/8000 sec, as well as a top flash sync speed of 1/250 sec. An electronic shutter function also avails a top shutter speed of 1/16,000 sec to better enable working in bright conditions and with wider aperture settings. 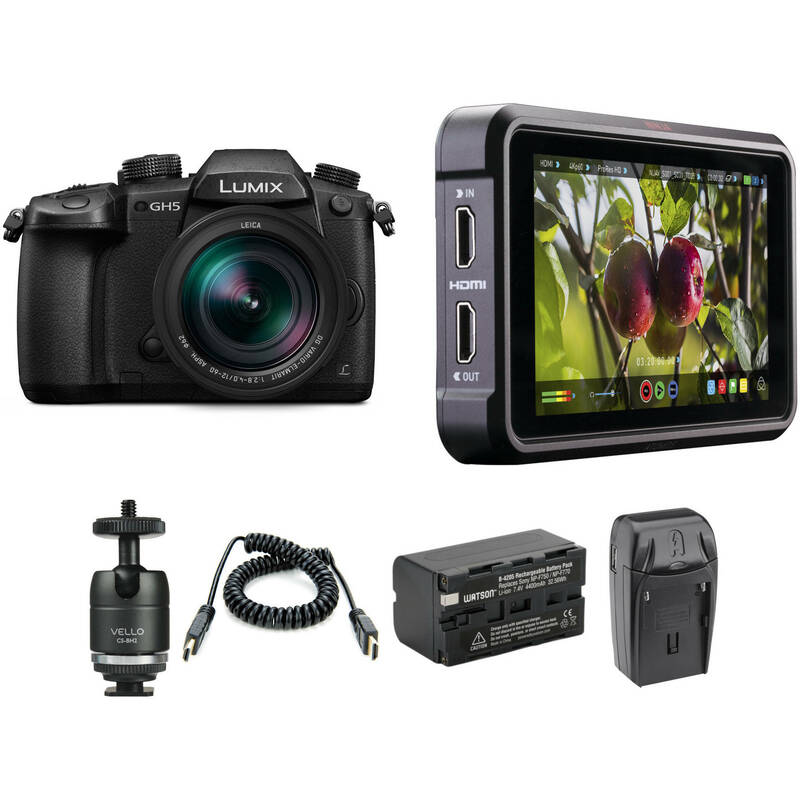 Box Dimensions (LxWxH) 11.3 x 6.1 x 5.8"
Lumix DC-GH5 Mirrorless Micro Four Thirds Digital Camera with 12-60mm Lens and Ninja V Kit is rated 4.6 out of 5 by 147.